Home - E.H. Dark & Son Pty. 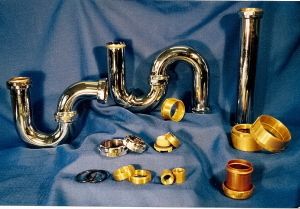 Ltd.
For more than fifty years E. H. Dark & Son has been manufacturing plumbing supplies. We supply all the major retail plumbing outlets with S Traps and P Traps manufactured out of brass or copper with a large range of finishes including Gold Plated. We have the latest in C.N.C. Machines and can produce parts with the highest degree of accuracy. E. H. Dark & Son is capable of milling, drilling,tapping and cutting virtually any shape that is mathematically possible. Our machines will take bar up to 100mm in diameter; we can drill and tap holes in diameter and faces of parts. We can mill squares, hexagons or octagons and of course turn threads inside and outside of the tube. Our plumbing fittings have earned the Water Mark Licenses from Quality Assurance Service of Standards Australia. We are Australian owned and run.